LENOX -- "It was in music history class," Kay Rhie remembers. "I think it was [Stravinsky's] 'Rite of Spring' that made me want to be a composer." She laughs. "The classic story." Joan Tower recalls her own light-bulb moment. "Hearing my first piece!" she says. "It was such a disaster that I had to fix it. And I've been sort of fixing things ever since." Alexandra Fol started by fixing not her own music, but Mozart's. "I was 5, and we were having dinner. And I was saying, 'Oh, my God, Daddy, there's this piece I'm playing with the wrong chord.' And my father said, 'OK, why don't you just write the good version?' And I thought, 'Oh, that's an idea.' "
William Bolcom started even younger. "My mother told me that when I was 2 or 3, she was playing the piano -- she was playing 'I Love You Truly.' And I started playing along," he says. "I always wanted to be a composer. I can't remember starting because I was so young; when I started teaching, I realized there were a lot of things I don't remember how I learned." This year's Festival of Contemporary Music at Tanglewood kicks off today with an unusual focus: the "Generation of '38," a remarkable crop of American composers born in or around that year, including Tower, Bolcom, and festival director John Harbison. But Rhie and Fol represent another generation at Tanglewood, this year's class of composition fellows: six composers in their 20s and 30s who are spending eight intensive weeks in the Berkshires honing their craft. And for all the changes of the last 50 years, conversations with both groups of composers -- by phone with the older generation, over lunch at Tanglewood's open-air cafeteria with the fellows -- show that the similarities are just as striking. One of the biggest revolutions between the generations is the ubiquity of computers. Personal computers were originally used primarily for musical notation, but as the technology has evolved, their ability to play back music has become more of a concern to the elder composers. "You can hear everything played in the right rhythms, at the right tempo, without having to puzzle it out at the keyboard or imagine hearing it," Harbison says. As for the ultimate effect on the imagination -- "That's something I've not yet found a way to quantify," he says. Bolcom sees a danger of the computer replacing the composer's imagination instead of sparking it. He tells of visiting Igor Stravinsky and finding that he had dampened his piano strings with cloth: "He'd play and the note would just be this 'plink,' and in his mind, he would assign the shape and the color of the note. That's what's missing -- that hearing it in your mind," he says. "The ear isn't as developed because there are too many helps." A member of the younger generation shares Bolcom's concern. "I'd much rather hack through something really badly at the keyboard," says fellow Andrew McPherson, "because it requires a certain extra leap of imagination." Turin-born fellow Fabrizio Rat Ferrero uses the computer, but only to map out possibilities. "I usually try to set some particular rules, and then I improvise inside these" -- something that comes easily to him in his other career, as a jazz pianist. It's similar to Tower's approach: "I'll make conceptual decisions, or have conceptual ideas, but they have to be checked out at the keyboard -- you need that visceral experience. That's where my instincts take over." Rhie, a native of Korea who's studied at UCLA and Cornell, composes at the piano, but uses digital playback as an additional resource. "I do find some of the surprises to be influential enough that I would change things, so in that sense, the computer can be helpful." Finding outside surprises may require more effort. Radio was important to Harbison's development, but he considers the current mass-media landscape, for all its expanse, to lack the variety he was exposed to. "If you just wandered around [the dial] randomly, you'd come across all similar material," he says. Tower attended Boston Symphony concerts: "I was 17 or so -- I sat in the front row and flirted with the first-chair players. I had no idea what I was listening to." But "it does get into your bones, your subconscious." The fellows have their own ways of mining a world of on-demand, do-it-yourself programming. Kati Agócs, born in Canada and educated at Juilliard, emphasizes the importance of community. "We have a kind of homing device -- we pick up on little comments that people we respect make -- and they lead us to new things, and then composers connected with those composers, and so on," she says. "But it is a conscious effort." For them, the easy availability of all kinds of music alleviates any reduced serendipity. Israeli-born Asaf Peres, who shares a jazz background with Rat Ferrero (and Harbison), marvels at the ease with which he can communicate and share music with distant colleagues: "One of the advantages we have is that the world is so small." Yet they recognize that the ready availability of so much music in a certain sense devalues it. "If you really have to work hard to find something, then it becomes more important to you," says Rat Ferrero. Agócs, who is part Hungarian, spent time with an older generation of composers on a trip to Hungary. "They had been around under the Iron Curtain, and in the '60s and '70s they couldn't get Stockhausen and Berio and other scores. So they used to have these clandestine meetings, and they'd smuggle in scores and recordings," she says. "I think that music had a certain moral weight in society because of what they went through." For Bolcom, who teaches at the University of Michigan, the key to education is simply making music -- "hands-on, real music in real time with real people." He decries efforts by universities in the '50s and '60s to separate composition from performing, under the guise of giving composition more "intellectual respectability." "The separation was fictitious," he says. "We've had to reintegrate composing with the rest of musical life." For him, often the hardest part is just getting students to be true to themselves. "I'll have students come in with music, and you know it's not really theirs, they're just writing that way because of teacher pressure, or -- it should be said -- because of peer pressure. So I've had to try to help unfreeze people, to get them to write music that's their own." Every generation may come at composing from a different direction, but the inner process of creating music remains constant. "I sit down with my friend, and he's 25 years old, and he's got this job at a high school, and he says, 'Oh, my God, these kids, they're so wild,' " Peres says. "And I'm like, 'Seven years ago, you were in high school, and you were just as bad as they are.' Every generation is shocked by the previous one. . . . But I don't think the world has deteriorated that much. The core doesn't change. What's inside doesn't change." 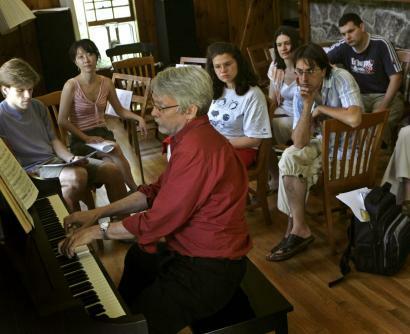 Matthew Guerrieri was a fellow in composition at the Tanglewood Music Center in 1998. He writes about classical music for the Globe and on his blog, sohothedog.blog spot.com.